Heaving in and connecting up 'The Probe' - Refuelling or RASing. By passing lines between two ships and connecting the 'span wire' to a strong point onboard the receiving ship, at a distance of between 80 - 120 feet apart. 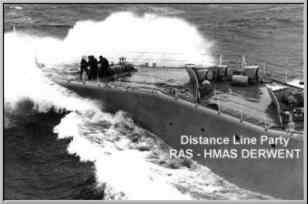 The RAS Party would heave in on the 'hose line' and the probe would travel down the span wire until it slammed home in its receiving 'bell' housing. Once connected up the engineers would start pumping and fill our tanks. Service was poor no-one ever once offered to check the oil or wipe the windows! 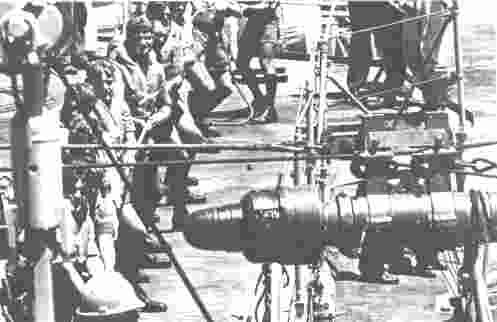 Ship's in a combat or operational environment RASed daily or at least every 2nd day and generally in the middle of the night! Dual Probe refuelling - Two transfer points one forward and one aft, simultaneously, this necessitates two RAS crews and sometimes stretches manpower resources when the ship has to remain closed up in operational 'Defence Stations'. 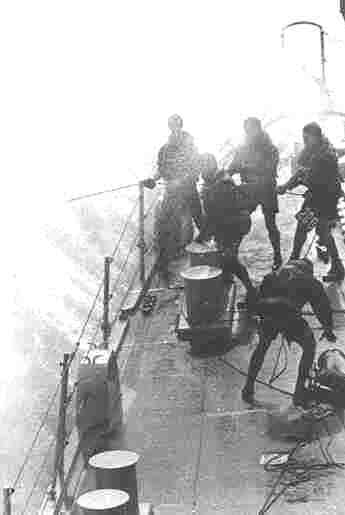 Especially if you carried out a Jackstay or Highline stores transfer amidships at the same time. HMAS Brisbane, USS Cimmaron, monsoon season NW Indian Ocean 1984. Above - Taken from MT 52 Deck HMAS Brisbane. 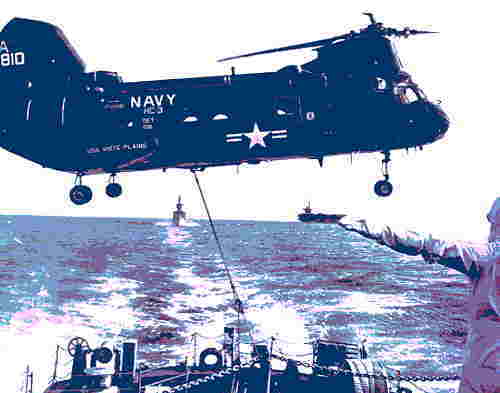 'Vertrep' or Helo Transfer. This became the most efficient way of storing ship. These huge monsters would zoom in, slip the palette and be gone whereupon scores of sailors would double past taking an item of stores with them. 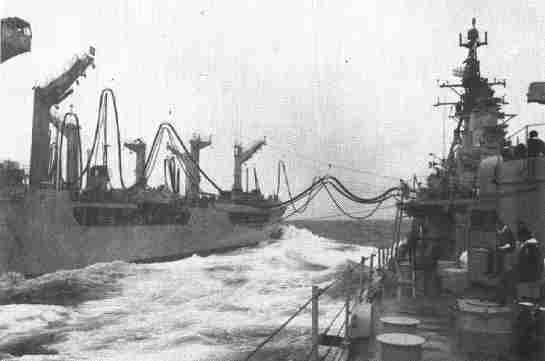 To take on stores the conventional way, by transferring lines between two ships was very time consuming, manpower intensive and left the ships vulnerable to attack. This method was both speedy and less manpower intensive. The Helo Jockeys don't muck about either, you better get that palette emptied and off the deck before the next one arrives! USS America in the Background. The Helo is from USS White Plains. Below: So as to enable the Skippers of the two ships to quickly, at a glance, see how far the vessels are apart a 'Distance Line' is passed between the two, with the 'Zero' end being made fast in the supplying ship and the other end being hand held by the 'Distance Line Party in the receiving ship. The line is marked by colours and numbers every twenty feet (lights at night) and as the ships move the Distance Line Party heave in or pay out accordingly, keeping the line as taut as possible. The line was held as far forward in bows of the ship as possible.Thus enabling the Captain to see at a glance how far he is from disaster. As you can see it was pretty 'Hairy' work on some occasions with waves breaking over them threatening to wash them overboard.